作者: Alin Ferrer on 21 June , 2017. 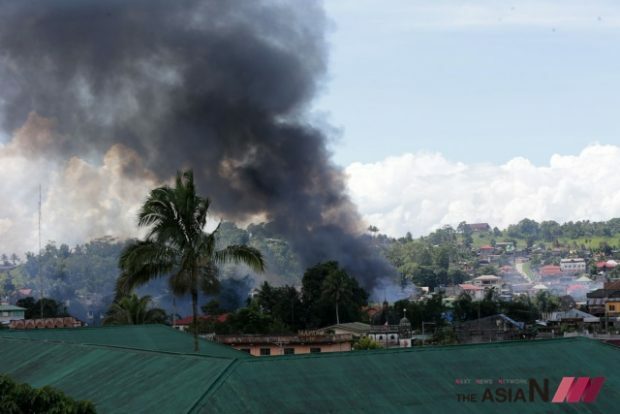 The conflict in Marawi City has entered its fourth week as of now. On May 22, terrorist groups attacked the city and set it ablaze, an incident allegedly inspired by ISIS. But let there be no mistake about this: the Maute group is a lawless group of bandits who are pretending to be Muslim jihadists. There is nothing Muslim about their lawless actions. As of June 20, 2017, more than 257 terrorists, 62 soldiers, and around 50 civilians were killed in disputes. These numbers are too high a price for our country that longs for peace in Mindanao. The whole of Mindanao was placed under martial law on May 23. Almost a month later, many questions remain—who is at the biggest disadvantage in this crisis? Will the hostages be freed safely? Can the government recover Marawi City? How can peace be achieved in Mindanao? One must remain hopeful. Marawi City has become a ghost town now, although several villages began reconstruction immediately following Independence Day celebrations on June 12. This is, indeed, a sad chapter for the beautiful city. Marawi is part of the Autonomous Region of Muslim Mindanao (ARMM), and the Philippine Statistics Authority has listed Marawi as the most populous in the region. About 90% here are Muslim and of Maranao descent. Marano means “people of Lake Lanao”. The old name of the city is Dansalan which means “meeting place” and the area’s hills are directly adjacent to Lake Lanao, creating a beautiful atmosphere and cool weather. And while Marawi can’t claim of being prosperous, its people are a proud one of their history and culture. The Maranaos are known for their skills in trade and business matters. Marawi is thus the capital of the region and plays an important role in commerce and industry. The people are also known for their high-quality and colorful sleeping mats (banig), blankets (malong) and woven products (habi). Of agriculture, they produce rice, corn, fish. Even in these modern times, market trading and commercial ventures enliven the entrepreneurial life of Marawi City. Truly, hard work and hope for a better future are the solid foundations of the Maranao. I recently talked to Ana (alias), a businesswoman operating a popular coffee/cakeshop in Marawi City. She said that her store gained a wide following because of the different cakes and breads preferred by the Maranaos. She is enjoying establishing her business as it was doing very well, and plans to expand to other branches in the province. Ana has invested five years to the business and is proud to be serving the Maranaos with her quality products, all at once, providing employment and helping her family. Her secret, she tells me, is to serve excellent products with low profit to ensure that her customers regularly come back for her food. She was sure that through hard work, trust, and dedication she would definitely succeed. Unfortunately, the Marawi crisis hit just last month. Everything was so sudden. Like other families in the city, Ana had to make the tragic decision to close and leave her shop, though it was depressing to have to leave her employees. People left everything, their homes, jobs, and livelihoods. After a few days, when the military said that it was safe to return, Ana was shocked to come back to her coffee shop that had been looted; as if a typhoon had hit it. Everything was broken and all was in a mess. It seemed the terrorists ate everything and took all the money. Ana wiped away tears as she tried to retrieve anything of what could be saved. As she scanned the wreck, Ana felt her dreams crumble in front of her eyes. Suddenly, she realized that she was reacting in the way the terrorists wanted her to react—to be afraid and angry. But she did not want them to win. Half-jesting, she said the terrorists must have really liked her cake because they didn’t leave anything. Ana gathers her hope within herself. This is why the terrorists will not and cannot win in Marawi. Ana symbolizes the very hope that terrorists can never take away from her or the Maranaos. Through this hope, Marawi City will reclaim its glory—this is the Maranao dream and mission; all derived from hope, faith, and courage throughout the people. Could ISIS leaders rename the terrorist group to Islamic State of Uzbekistan?